Sock Monkey Doll Patterns, Sock Monkeys are a Great Reason To Hug Your Socks! Funky Sock Monkeys is a super fun sock place where sock monkey doll patterns can be used to bring your socks alive! Find out what a sock toy actually is, if you don't already know and how you can create your very own sock animals and creatures. If you are feeling crafty you can easily learn how to make a stuffed sock pal. No experience is needed, just give it a go! You'll find the free sock monkey doll patterns and instructions are easy to follow and in no time at all you'll have your very own lovable sock monkey dolls. You can also make different sock animals not just monkeys. We also have fun craft ideas and lots of other groovy monkey and sock stuff to look at. You can find socks to add to your sock collection, either to wear or to make into some crazy sock creatures. There are so many styles and colors to choose from purple, blue, pink, striped, animal prints........ the list just goes on and on. That is great news for those of us who love socks, whether we are going to be wearing them or transforming them into a lovable, hug-able creatures. 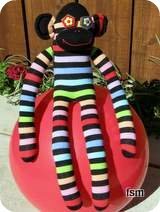 Funky-sock-monkeys is all about sharing ideas and having some fun easy craft projects to provide some inspiration on different ways you can add cuddly, soft monkeys and other sock toys into your family. 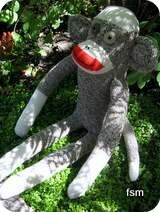 If you are new to making sock monkeys well a word of warning, it can be additive, seriously, but boy is it fun! Many unique animals can be made by adjusting the basic sock monkey doll patterns and the sock elephant pattern, such as cats, dogs, cows, bears, zebras, giraffes, reindeer, aardvarks. Aardvarks? Yes, well the first elephant that I ever made looks more like an aardvark. It was a rough day! If you are wanting a classic looking sock animal, you'll be needing Original Rockford Red Heel socks, otherwise you can use whatever socks you like. I personally love trying out different patterned socks, the results are so varied and it's fun to see what personality the sock monkey dolls come out with. one pair of socks, a pattern, a needle and some thread. If you are lucky enough to have a sewing machine that is great but it is not essential. You can grab a free pattern from here at funky-sock-monkeys or order yourself a pattern book. There are two pattern books choose from. 1) The "Original Red Heel" pattern book. 2) The updated version pattern book. Both are filled with heaps of patterns (over 50 in fact) for making different sock toys. The updated pattern book has color photographs of completed sock dolls. Keep an eye out for this little guy, he pops in tips here and there. 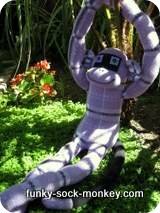 The Sock Monkey Blog keeps you up-to-date with all additions and changes to the funky-sock-monkeys.com Web site. Subscribe here. Cute sock monkey pictures. Fun monkey images of different sock monkey doll toys. Also pics of sock elephants, sock cats, sock cows and more. 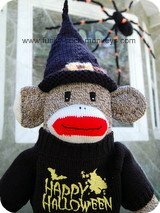 The coolest sock monkey knitting hat patterns. Toy hat patterns you can adjust to make any kind of sock monkey hat. 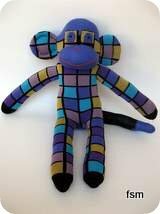 Cool sock monkeys for sale and other monkey things like ornaments, dog toys, hand puppets, wall clocks, mugs, kits and many more monkey merchandise. You can even adopt a monkey - a sock monkey toy. Lets party! Fun monkey party supplies for boys and girls parties, Ist birthday or a monkey baby shower. Cake pans to make homemade monkey cakes, decorations, favors, invitations, hats, and more. Buy a socktastic sock monkey book featuring a lovable sock monkey toy. Follow Rockford sock monkey dolls on exciting adventures in fabulous stories with wonderful pictures. Contact Us at Funky Sock Monkeys.